Transformers change the voltage of an alternating current (ac) electrical supply. Some times transformers make the output voltage bigger than the input voltage, this is a STEP UP TRANSFORMER. In a step up transformer there are more coils of wire on the secondary coil than on the primary coil. Some times transformers make the output voltage smaller than the input voltage, this is a STEP DOWN TRANSFORMER. In a step down transformer there are more coils of wire on the primary coil than on the secondary coil. Transformers are used in the national grid. 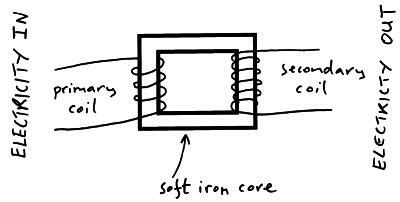 Alternating current (ac) in the primary coil (input coil) produces a changing magnetic field in the laminated soft iron core. The changing magnetic field induces a potential difference (voltage) in the secondary coil (output coil). Where Ipis the current in the primary coil and Is is the current in the secondary coil. Click to go to Switch Mode Transformers.